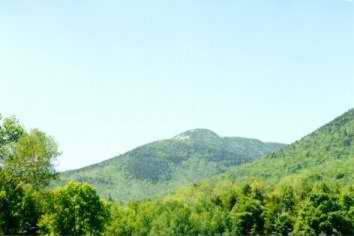 From the base of the mountain, in the Ferncroft parking lot, the summit of Whiteface looks ominous, but beautiful. 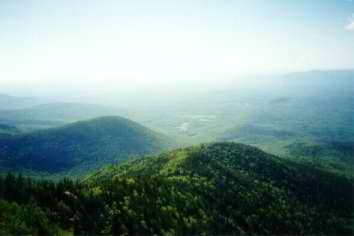 And when you can get the weather to cooperate with you, the trip is one of the most scenic in the White Mountains. 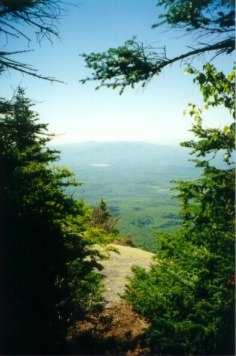 The trip to the summit is approximately 3.4 miles along the Blueberry Ledge trail, the most sensible route if you only plan to go for the day. The Blueberry Ledge Cutoff is a nice diversion along a ridge that descends to a running brook if you don't mind adding some distance to your hike. The hike begins on a dirt road outside of the Ferncroft parking lot and follows the road for about 1/8 mile through what looks like people's front yards. However, there are signs that direct you towards the trail, so you know you're going the right way. Once you enter the woods, you walk about 200 yards before the junction of the Blueberry Ledge cutoff presents itself. If you decide to take the cutoff, you will follow a ridge on a steady uphill climb, until you reach the ledge itself, about a mile and a half. Rob and I decided to bypass the cutoff because the information center in the parking lot indicated the trail was still in rough shape from the ice storms we had this past winter. This proved to be a wise decision, as we learned from two hikers we ran into on our way down. Evidently there are some difficult areas of the trail. Rob and I decided that the Blueberry Ledge Trail was the way to go, so we gathered our stuff and prepared for our first trip of the year. Actually, this	was to be a short trip to test our gear and be sure nothing was wrong with any of it. This would later prove to haunt us! So we gathered our gear and began the walk past the summer camps and into the woods. From the beginning the trail was in good shape, with little to keep us from moving at a fairly fast pace. Nothing that is, except for our legs. 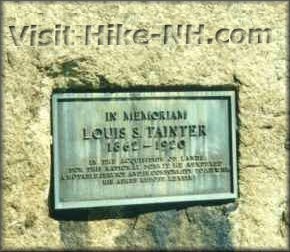 Although the trail follows a gradual incline at first, we were soon panting and taking breaks to allow our heart rates to drop below 300. As we continued along, periodic views of Mt. Wonalancet, which was surrounded by a slight haze, caught our eye. The bugs were tolerable (with a healthy dose of Ben's 100) and every once in a while we were greeted by tree frogs, which were about the size of a small apple. After about an hour of hiking, we arrived at the Blueberry Ledge, an area that lives up to its namesake. Limited views from here make it a nice place to rest for a while, but anticipation of the higher elevations got us moving before too long. 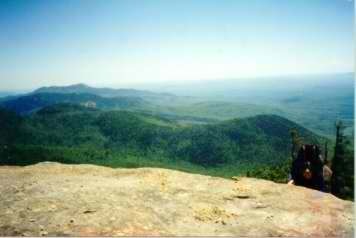 Soon after the Ledge, the hiking gets tougher. Inclines increased force your	heartrate into orbit, unless you've been training for the Olympics. Rob and I found the large rocks that littered the trail a little trying, but we soon forgot them as the sweat poured into our eyes. Don't you hate the first hike of the year? For the next mile and a half, no views are available, so it's just pure hiking through the birch, pine, and maple filled woods. Not a bad thing, because your hard work is paid off from the 2.5 mile point and on with fantastic views to the north and south. As we got towards the summit, it became clear why the AMC guide says that this can be a dangerous hike during inclement weather. 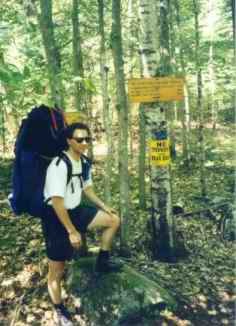 With about 1/2 mile of the summit, the trail consists mainly of steep rocks and narrow passages. At points, the trek almost seems like mountaineering, worthy of climbing ropes and hardware. However, as long as you move carefully and deliberately, you will make it up with nothing more than a scrape or two (that brown blob in the	picture is Rob getting over a rough section). As always, the summit is well worth the effort. Views of Lake Winnepasauki, Mt. Chocorua, and Passaconaway make this a treasure for outdoor photography enthusiasts. 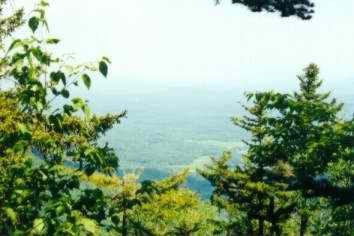 This is a typical view from the summit. . .
One of the unique parts of Whiteface is a plaque that has been driven into the rock. This plaque seems to have been moved at least once, as there is a section of concrete in another rock, about the size of the plaque that is empty. On this rock is a marker from the US Geologic Survey that indicates the precise location of the mountain. The trip back down from Whiteface proves to be almost as difficult as the way up. The tough rocks and steep trail make getting from the summit to the lower sections a slow process. But again, with careful steps and some patience, getting back to the parking area is just as scenic, but in half the time.